Smash Up is a shufflebuilding game, I say ‘a’ it could well be the only shufflebuilding game. To play you build your deck by selecting two factions and shuffling them together, see shufflebuilding. These factions cover every single form of gaming and nerd culture trope possible, there are pirates, ninjas, zombies, robots and plenty of others. There are even loads of expansions that add lovecraftain monsters and pretty girls with steam powered jet packs but we’ll leave expansions out of today’s discussion. With your deck now built, and shuffled, it’s time to start claiming some bases and scoring some points. A number of bases are dealt out, each base having a threshold and three scores. To win the base you simply have to be the player with the highest combined power of minions when the total power of all minions at the base exceeds the threshold. Players then get awarded points for first, second and third place as outlined by the base card. Most cards take a traditional route and award less points the further down the podium you stand; however the odd base will do something sneaky like offer more points to the player in second place. Every minion has its own abaility making every card and deck unique. Each turn you get to play one minion card and one action card from your hand. That’s where the simplicity ends, because every minion and action is different and every faction has its own style. 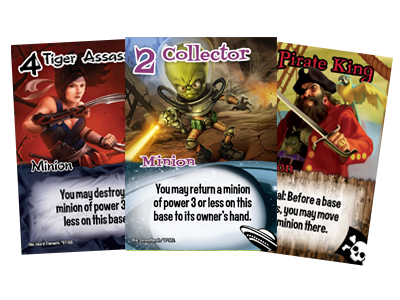 Zombies claim cards from the discard pile, wizards cycle through their deck, Ninjas can assassinate or move in at the last minute and aliens teleport people in and out of bases. Smash Up’s true beauty emerges when you realise how best to combine your two factions. At first Smash Up seems a bit slow, you play a couple of rounds and you start to think that those bases are never going to score, and then all of a sudden the game gains momentum. Players are chaining actions and minions, moving minions between bases and boosting their minions’ power. What felt like a slow and strategic game suddenly because a fast and furious attempt to outsmart and outmanoeuvre your opponents. Before you know it bases are scoring all over the place and players are suddenly close to claiming victory. 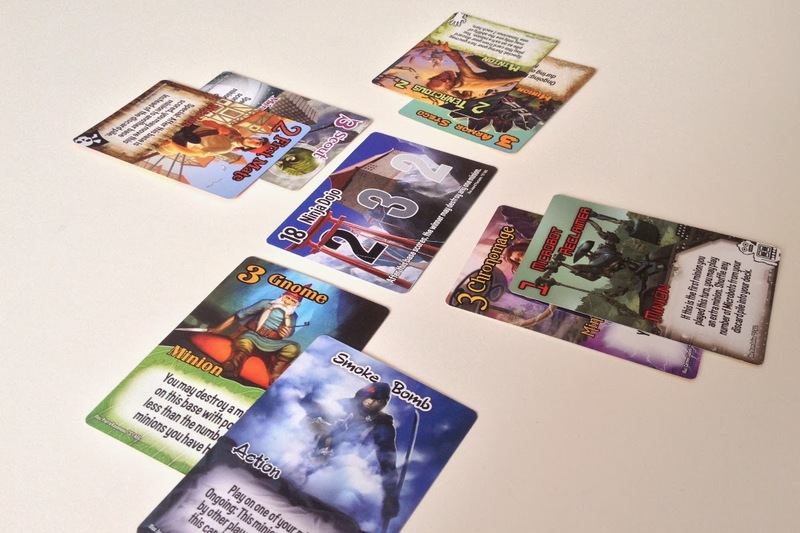 By its very nature every game of Smash Up plays differently as the different pairings of decks can lead to drastically different strategies. It’s a credit to the games designers that each deck has a distinct feel and play style and remains fairly balanced. It’s not quite perfectly balanced as some combinations definitely feel over powered but this can also be attributed to a crafty player who’s twigged on how to fully take advantage of the amalgamation of factions. This base is about to pop! The biggest complaint I have with Smash Up, and this may be a bit of an odd one to most people, it’s a very messy game. 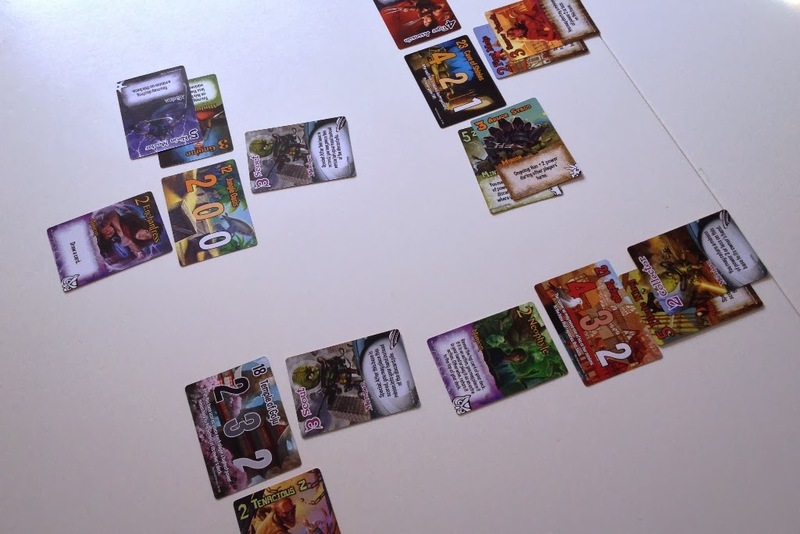 The nature of Smash Up means you are stacking cards around various bases and, especially in four player games, it gets difficult to keep things tidy and in a way that information is easily accessible. Due to the varied nature of the decks there could be many effects in play at one time; I’ve never played another game that causes the dreaded “well if I’d known that I wouldn’t have done that” effect. If you are a keen boardgamer you’re bound to have come across this problem at some point; a player who can’t process all the information in front of them, either due to poorly displayed effects or just not seeing everything and so complains after they’ve found out their move was a bad one. Smash Up is also the game where I have witnessed the most crippling analysis paralysis in any game I have ever played. Smash Up should take around an hour to play but unfortunately one game took over two hours as the majority of players analysed every single option available to them. Now this could be seen as a flaw with the game but in hindsight this group of players definitely weren’t suited to Smash Up’s particular breed of nonsense. Smash Up does present players with a huge amount of options. You could be choosing between five different bases and from 10 cards in your hand and there’s a damn good chance that every choice available is a bad one and the problem is that some players just aren’t able to process all of this information. The best games of Smash Up occur when the player’s don’t try and process it all and just go with the flow. WIth a lot of bases in play it can get rathyer messy. Both of these issues occur when players take Smash Up far too seriously and if you’re analysing Smash Up this much then quite frankly you’re playing the wrong game. Smash Up is silly, the whole concept is internet meme levels of ludicrous, and if you’re going into this game with the mindset of a military commander then Smash Up is not for you. You need to go into this game with the aim of having fun and that’s what games are all about; fun. Sure you have the opportunity to totally screw over the other players and completely ruin their day but that is one a type of fun and quite acceptable. Smash Up is silly and clever at the same time, it’s a game that doesn’t take itself too seriously but still has plenty of depth. The whole shufflebuilding concept means that games are different every time and the whole concept is going to keep getting better as more variety gets added via expansions. It’s the game that people who think they like Munchkin should go and play, Über geeky and full of references while at the same time being a damn good game.